As Philadelphia wedding photographers, we always enjoy exploring new locations and new wedding venues throughout the year. One of the most remarkable wedding venues that we recently had a pleasure to work at was Appleford Estate, located in Villanova PA. When you first arrive at the Appleford Estate, you instantly fall in love with this magical place. Nestled in abundance of beautiful greenery, the Appleford feature a few gorgeous ponds, mini waterfalls, numerous flower beds, a stunning tree tunnel and so much more. Located only 30 minutes from Philadelphia, this wedding venue has become extremely popular among Philadelphia brides and grooms who are looking for a natural, romantic setting for an outdoor ceremony and reception. 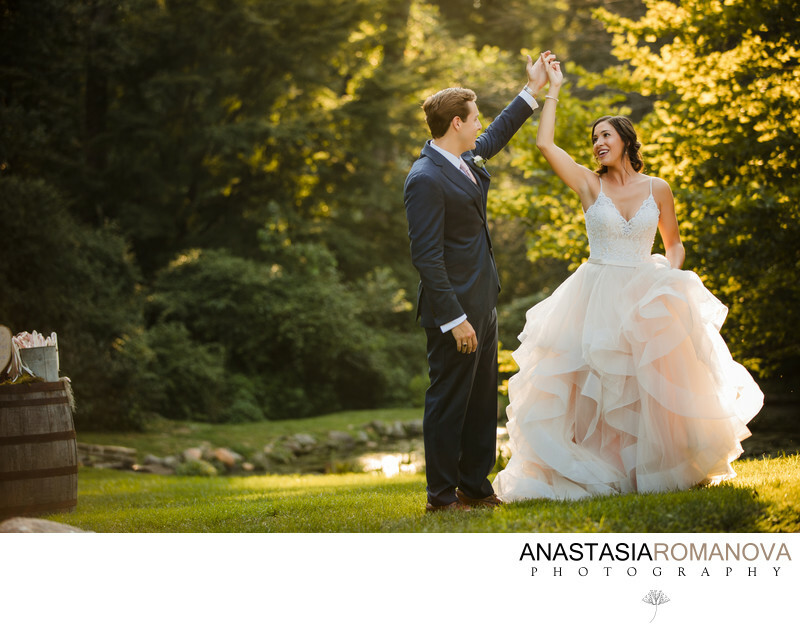 One of the best things that I love about Appleford Estate as a Philadelphia wedding photographer, is that everything is happening at the same location. The venue features a gorgeous bridal suite for bridal preparations. You have numerous impeccable locations for a first look. The ceremony spot under the willow trees is beyond stunning and looks phenomenal on wedding photographs. The cocktail hour at the Appleford Estate weddings is usually held outdoors. Beautiful forge tables and chairs are spread all around the territory so that your wedding guests can enjoy each and every corner of the magnificent outdoors. The wedding reception takes place under a huge tent connected to the main building of the estate. It looks especially beautiful during the sunset when the last rays of glorious sun picks through the open walls and the backlit trees looks like pure gold. The golden hour is also my favorite time during the day for the couple's portraits at the Appleford Estate. Often times we don't have much time for those portraits during the reception, especially when the couple was having a first look and took the majority of their photos before the ceremony. However, I always try to pull the bride and groom out at least for 5-1o minutes for some additional golden hours photographs. The picture above was taken quickly during the Appleford Estate reception. All the key moments like first dances and toasts were done and people were waiting for their main corse to be served. This was a perfect timing for us to sneak out for a few seconds outside and create some magical golden hour shots. Location: 770 Mt. Moro Road, Villanova PA 19085. Keywords: appleford estate (12), appleford estate wedding (12), appleford estate wedding ceremony (12), appleford estate wedding cost (12), appleford estate wedding photographer (12), appleford estate wedding photos (12), philadelphia wedding photographer (450), villanova wedding venue (12), villanove wedding photographer (12).